Long day buffing today. Sudden and unexpected rush of sales means a very busy week coming up before Christmas. WIll be shipping out somewhere in the region of 10 bodies this week I think. Really pleased, just wish I enjoyed packaging more! This is for Marc, who I think may be a member here... 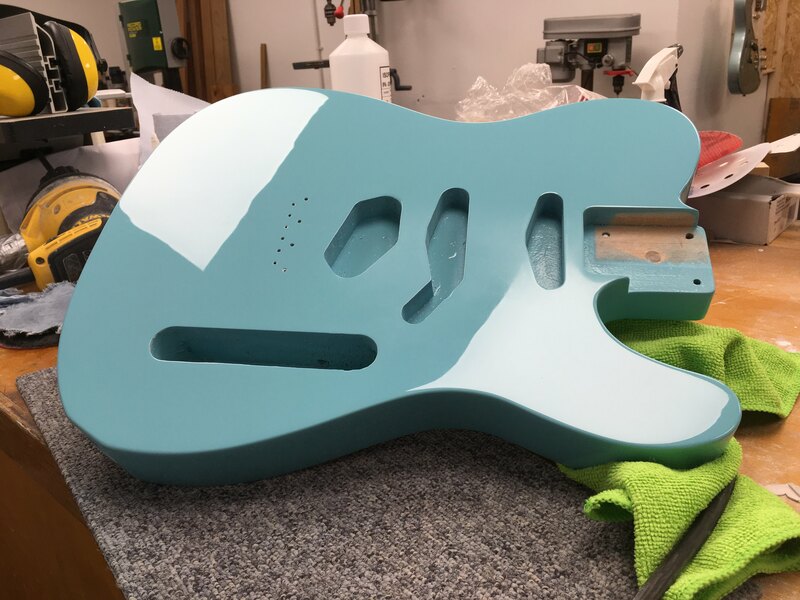 I routed the body for a Nashville configuration, fixed some very suspect ferrule holes on the back and gave it a high gloss Daphne Blue finish. Also sorted a neck for him, removing a snapped tuner screw (those damn things) and plugging it before redrilling. I'll probably give the body a final buff tomorrow before shipping out the whole package. 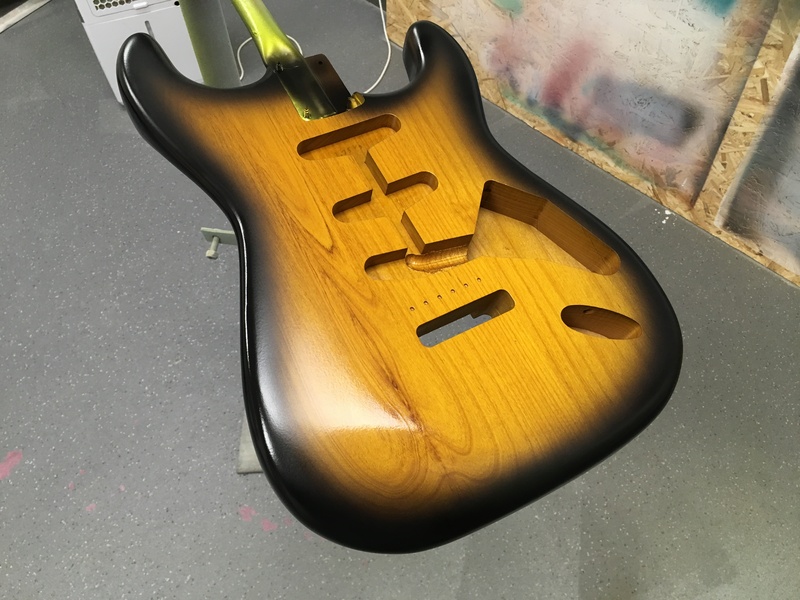 If you're pairing it with the roasted maple neck Marc it's going to look fantastic! Got to get this one out of the freezer this morning and get the final work finished and ship it. Customer is a John Frusciante fan so it's not going to look like this anymore when it's done... But I realised Fiesta Red is a colour I love but haven't posted much of so here it is - pre ageing. Just hastily threw it in the photo booth last night to get some shots. cheers buddy! You not normally a fan of the Nashville config? I like how it came out and customer drooling in anticipation so I'm pleased. A lot of aged ones have been through the workshop lately, just how it's happened really. I think I want to do another good run of shiny, factory fresh metallics in the new year alongside the commissions. 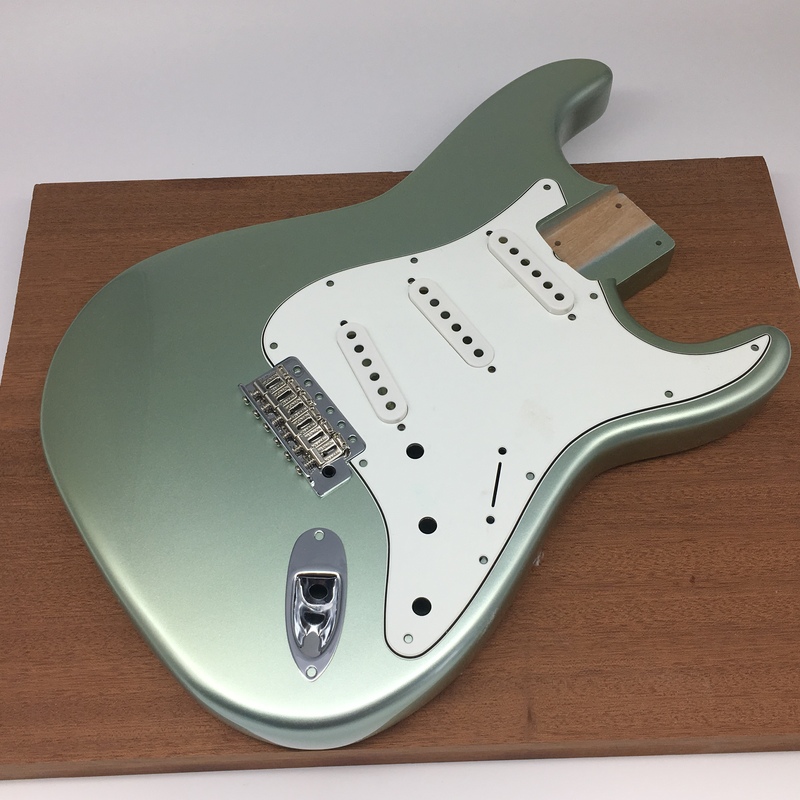 And finished up this Suhr for Stef - a mid sheen surf green NOS finish. 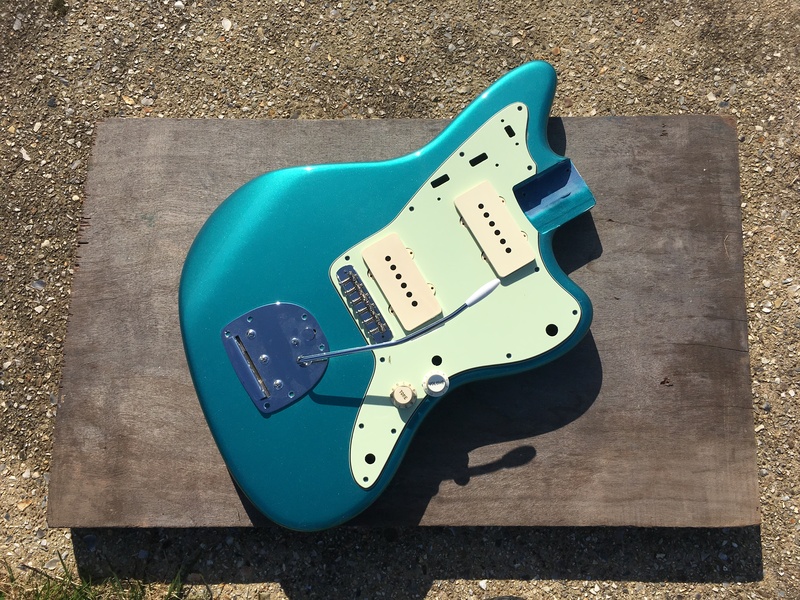 Actually it's 50% of my surf green and 50% or my seafoam green mixed to get this colour. 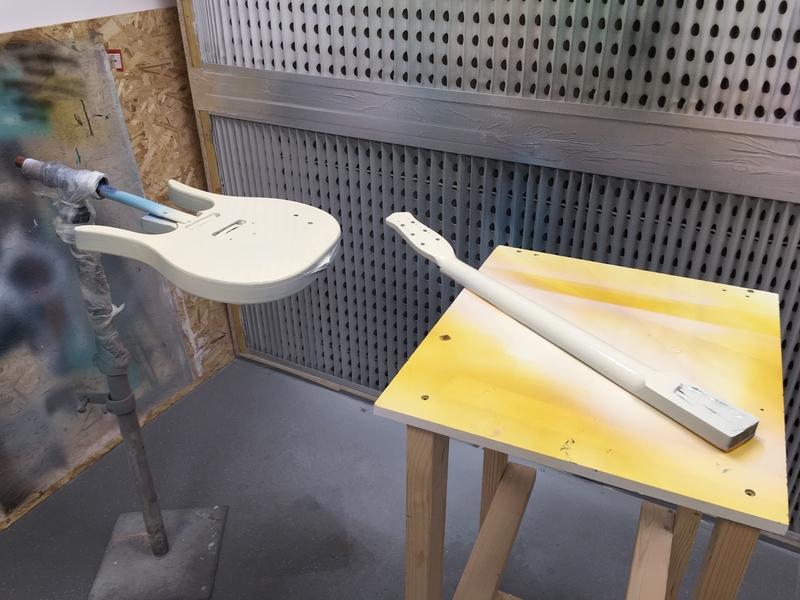 Interesting restoration of a 60s Danelectro Guitarlin is underway too. Masonite is horrible to paint. Sealed it with shellac first to give it a barrier coat. 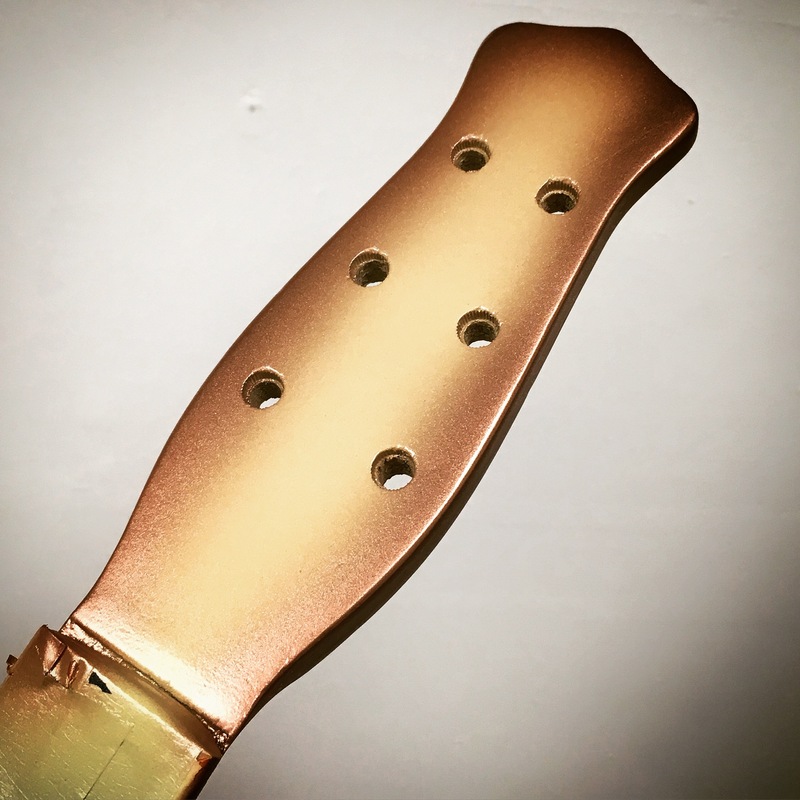 This is going to be an authentic cream copper burst when done! December was busy, busy, busy. January's looking mental! Which is great, though I could really use an extra few pairs of hands. Thanks everybody here who has booked a refin, bought a finished body in or just looked at my work. Here's something that was not an easy job, very nasty to strip and then when was finally finished had to be completely stripped again thanks to some kind of ungodly reaction in the lacquer which didn't show up until late in the game. One of those things you have to deal with in a way other than smashing your head against the wall. 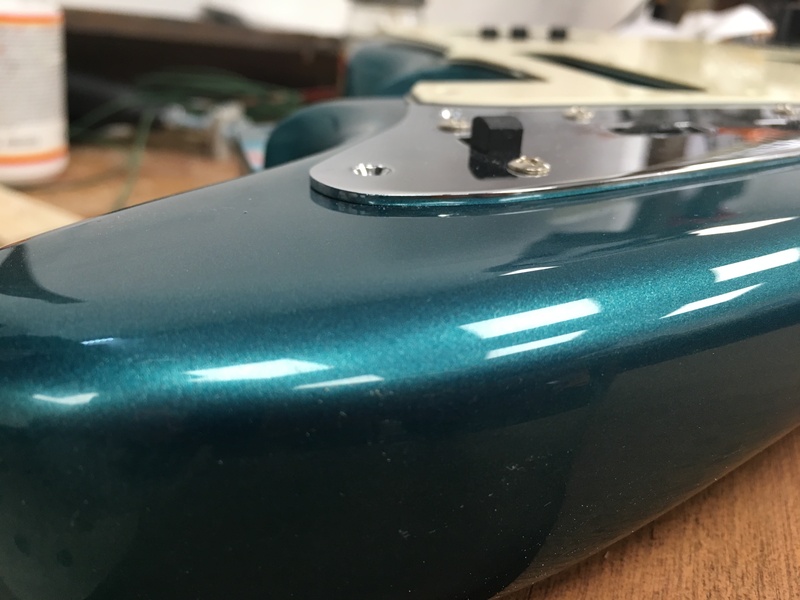 All good in the end though - factory finish Ocean Turquoise Metallic refinish on a Classic Lacquer Fender Jag. 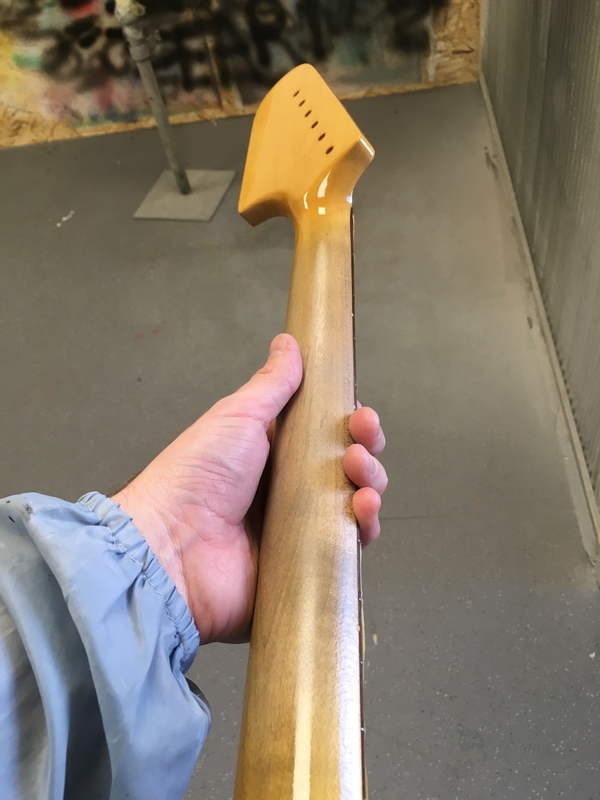 I'm just buffing the matching headstock today. I had an absolutely brilliant time at the Guitar Show this past weekend. Many great things on display and nice people around. So so good to hang out with @miserneil, @Stu_tate, @FelineGuitars ; @digitalscream @Bridgehouse and a surprise appearance from @TTony who first offered me the opportunity to come along. Thanks guys! it was a really positive weekend - met a lot of past, present - and future -customers and had some great feedback, which really made it special for me. Great meeting many fretboard faces too. About 25 jobs on the go right now so I’ll try to post more pictures as these come to fruition (hopefully sooner rather than later) and there’s also a few exciting new prospects on the horizon. Thanks @rze99 hope all is good for you! OK here's some nice pictures a customer sent to me the other day. 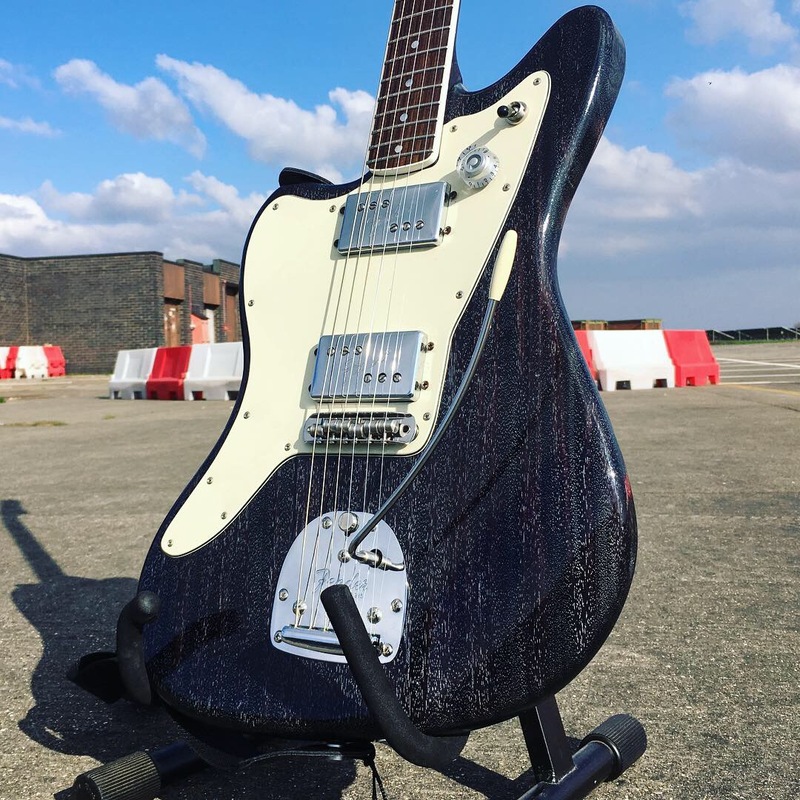 I refinished this 1964 Jazzmaster for him back in 2017 I think but he just had a bit of a photoshoot. This was a silver basecoat CAR, which we decided was period correct for 1964. 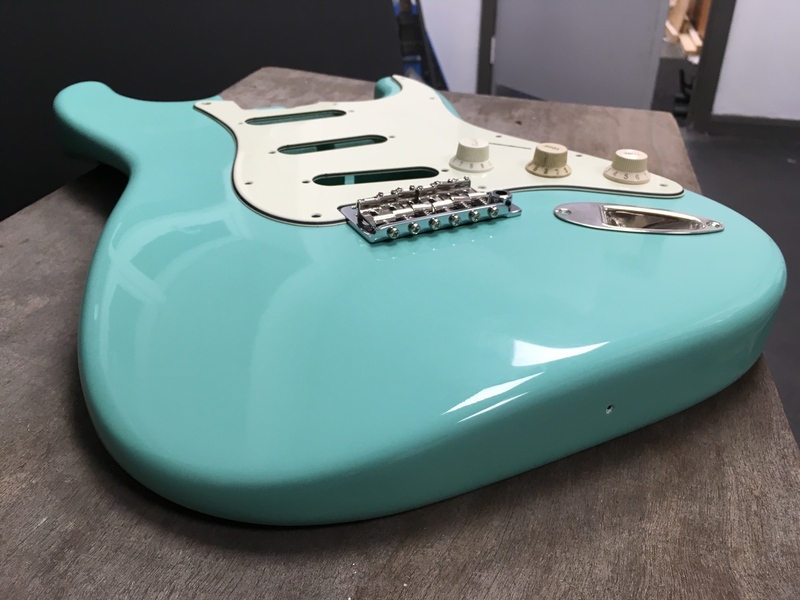 Not normally one for tort guards on custom colours, but he wanted to use the original guard on this guitar and I think it looks great! 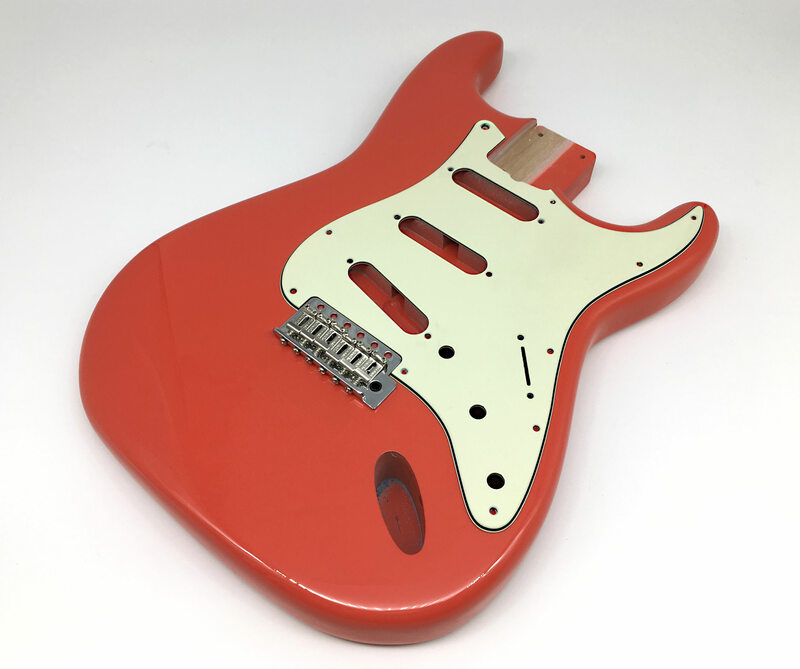 I took a lot of measurements from this guitar while I was working on it to make templates and those are nearly ready, so this spring/summer when I have a bit of time (god willing) I'll be making some JM bodies from these for the real vintage nerds. Probably by a combination of CNC and hand woodworking. 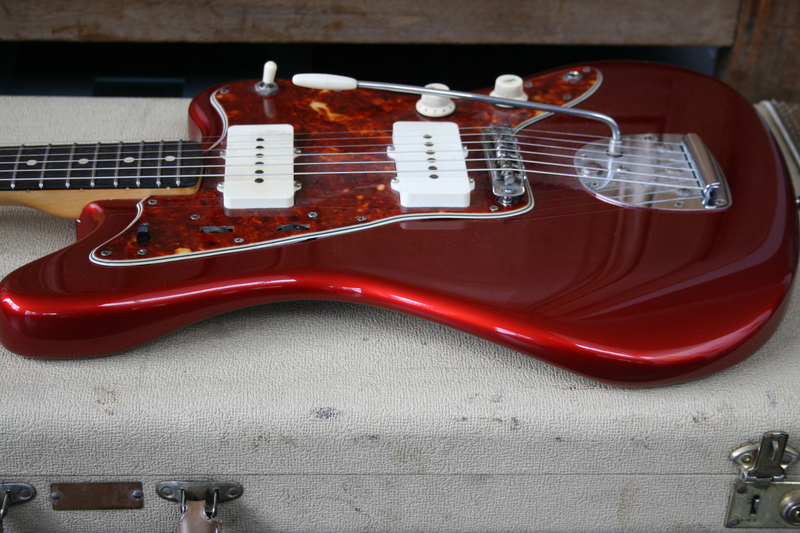 Got my vintage Jaguar templates and CNC files (made from a 1966 and a 1964 body) sorted last week so they're also on the cards soon too. 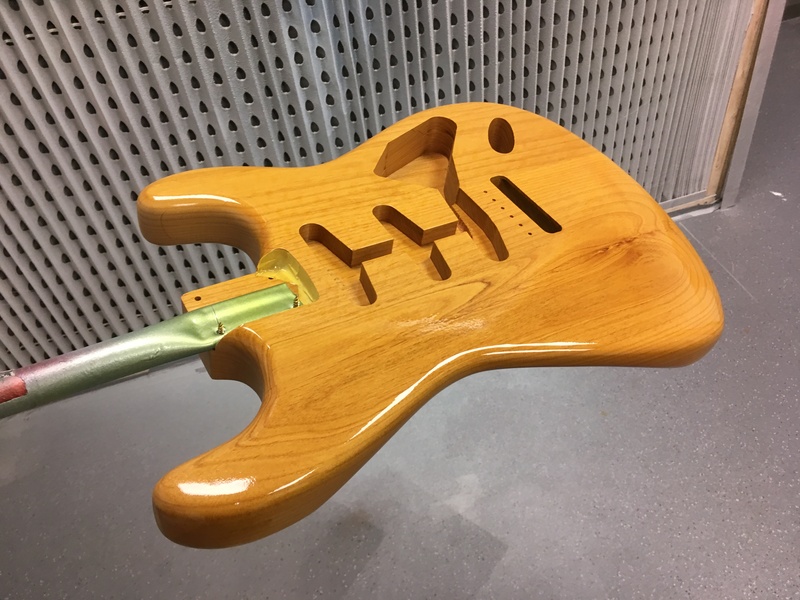 I also spent some time this week on trying some new methods for creating that ubiquitous aged and worn effect on the back of maple necks. 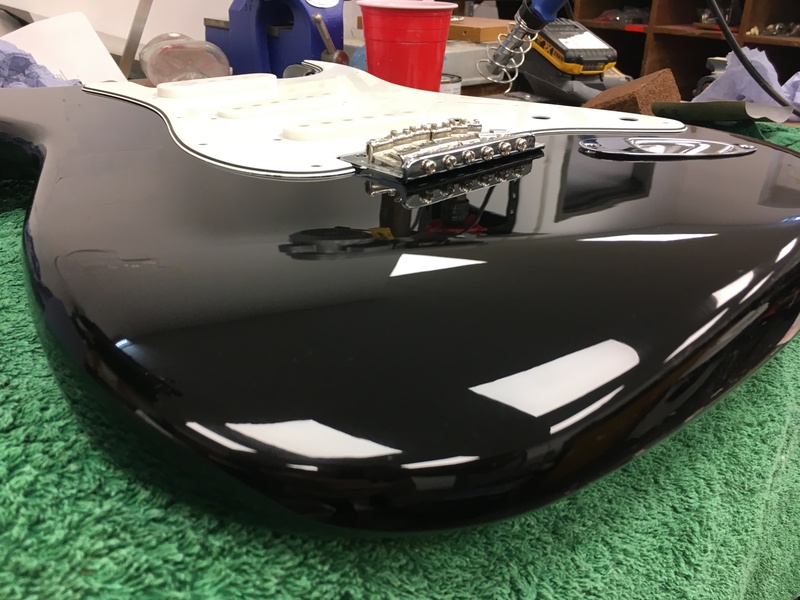 A pet peeve of mine is seeing it as a horrible black patch with an abrupt transition and streaky orange lacquer unevenly sanded off. 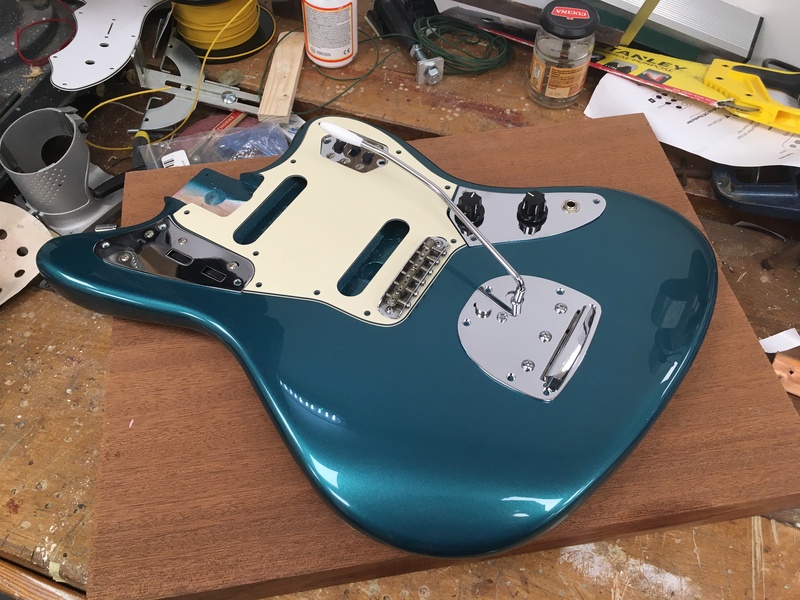 I've been lucky to play a few unmolested 1960s Fender necks in the last few weeks which spurred me on to put some work in on this. 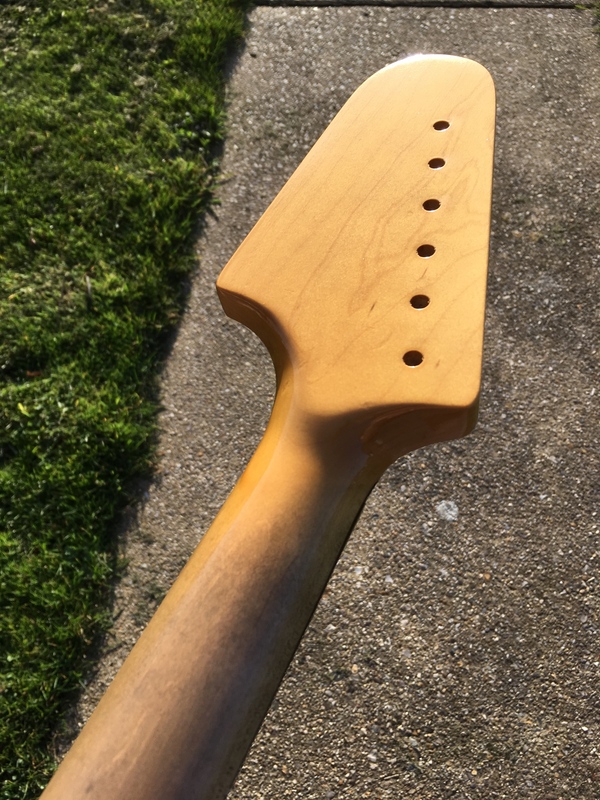 Getting there I think, but I still reckon it's always going to be a case of treading a thin line with this kind of work as it can so easily go too far, especially when you're taking stain to a bare maple neck. I'm going to stick to my less is more approach. Totally with you on the fake black back of necks. Most of them just look crap. Your shots look lovely, much more realistic and appealing. 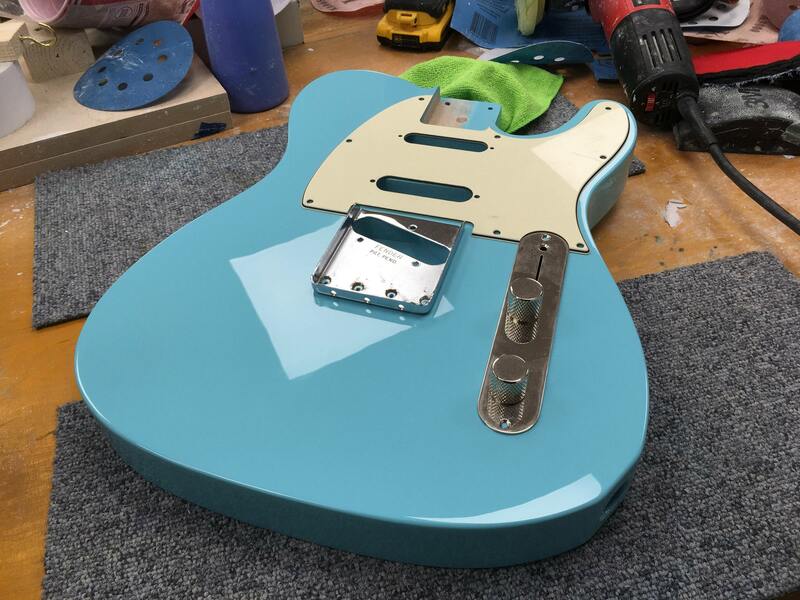 If you are going to be making vintage correct JMs I just might have to sell a Tele or two to order one! Got to say, your work amazes me! 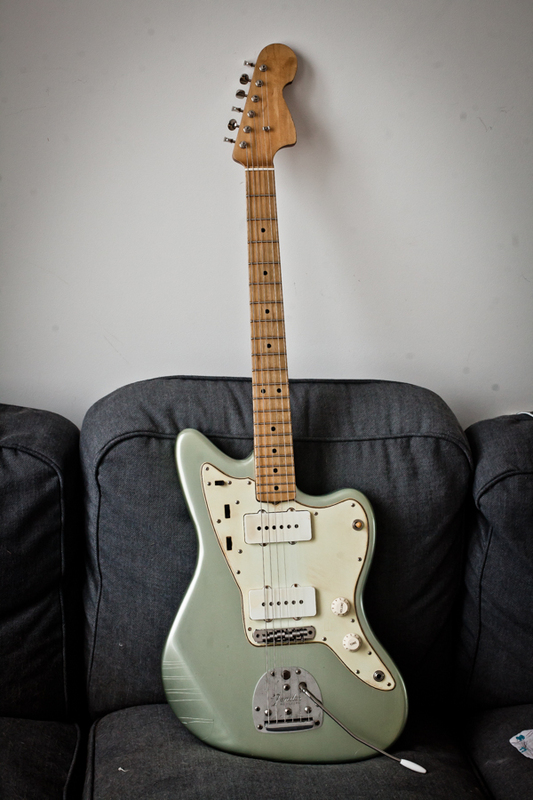 I think they're the best aged guitars I've seen and this is my favourite thread! I keep scheming in my head about ordering something from you ... One day! 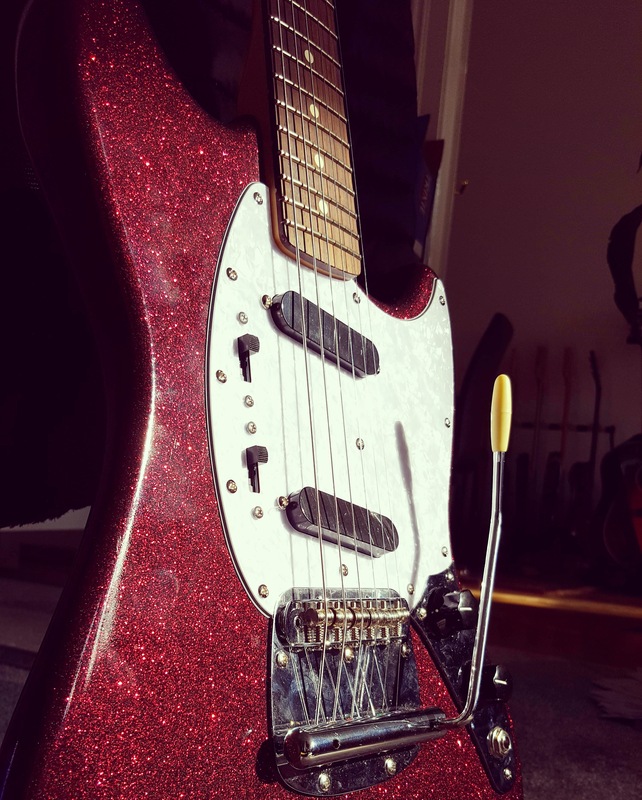 Anyone remember my Black Cherry Sparkle Mustang body? Got a picture back from the customer who just finished the build. I like it! Also, this was very cool to see - some more pictures by a customer who recently finished their build. 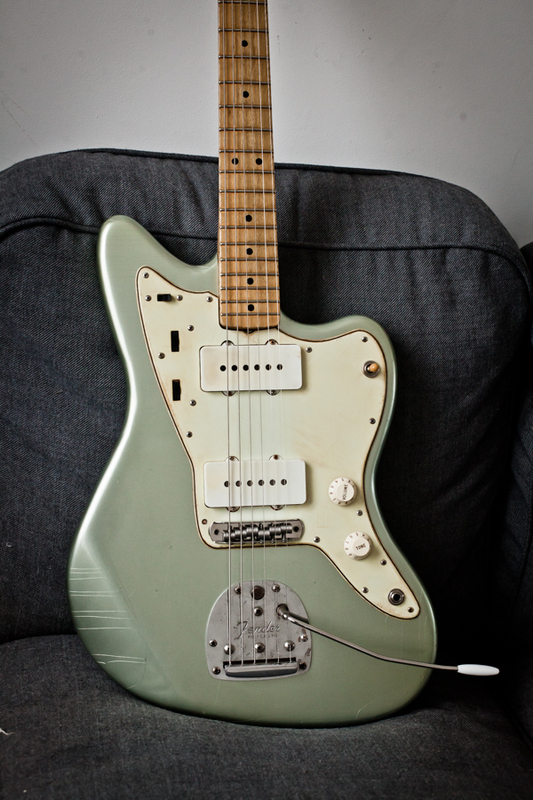 This is one of my aged Firemist Silver JM bodies paired with a Danocaster maple neck. 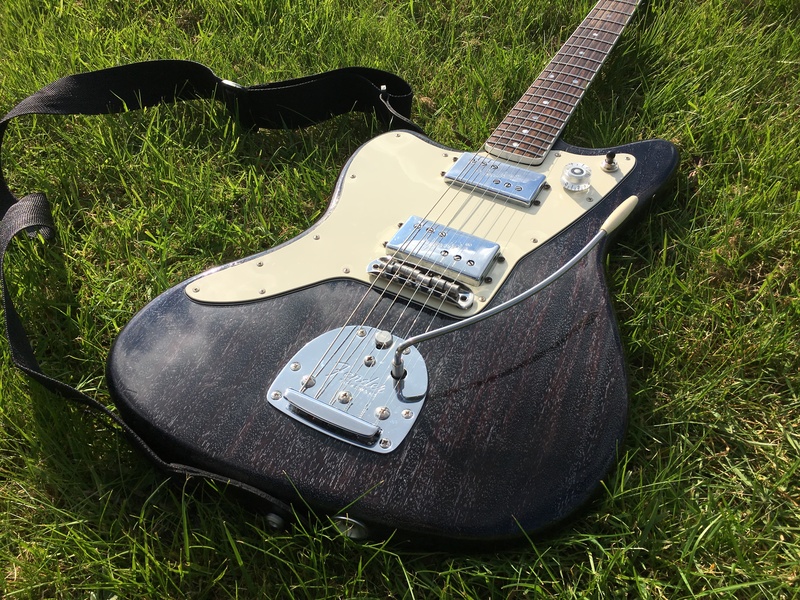 Dan is a cool guy and I love his work so this made me happy to see people on offsetguitars.com enjoying this one so much. 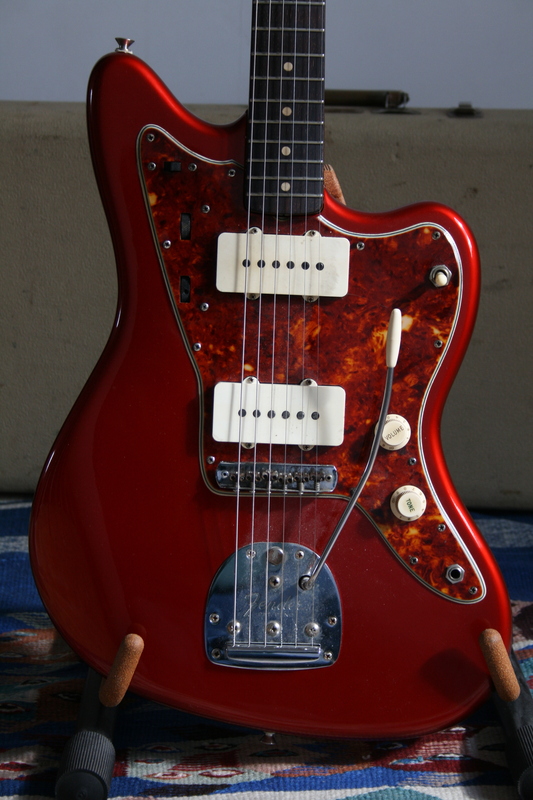 Gets me thinking now that those new Hosco maple Jazzmaster necks are here in the UK! Wow @rexter fantastic work. 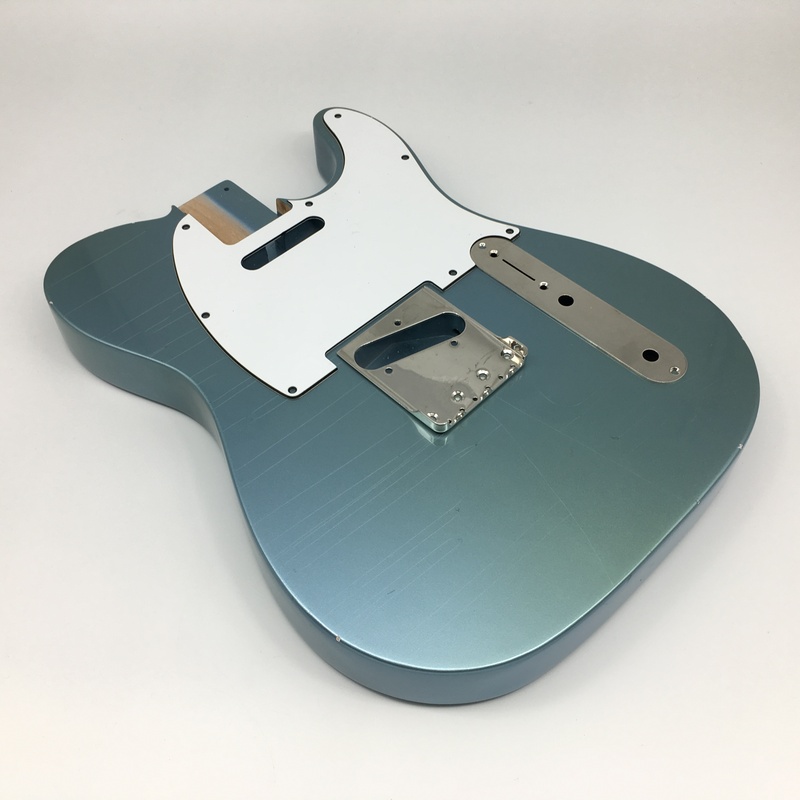 Love the Firemist and Blue Ice metallic types... just gorgeous! Thank you Richard! Yeah, I do tend to gravitate towards them, far prefer working with metallics than solid colours really, just love how light sensitive they are and how nicely they take tints and ageing. BTW apologies for not being in touch with thinline pics - I just kind of crumpled this weekend after 12 days back to back at the workshop but some of my vigour is restored after a rest so will try to get some sorted out. No probs - take it steady don't do yourself in! 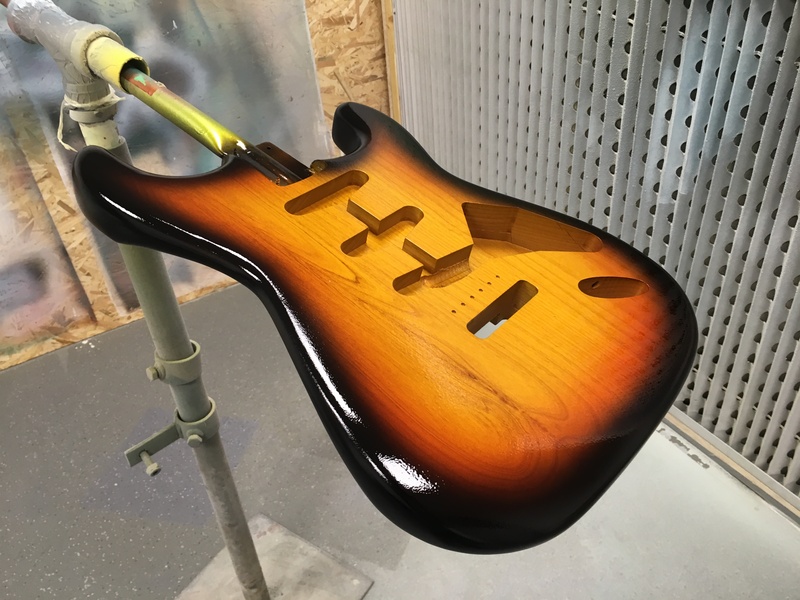 Always admire anyone who does a solid black guitar, as you know yourself, and in my opinion, the single hardest colour to achieve a swirl free finish on. Beautiful work Jon. @lamf68 Thanks Rich, appreciate that coming from the master himself! Hope you're good. It's funny I was almost going to do a post on facebook along the lines of: 'The simplest finish which is actually the hardest to do' in reference to gloss black. 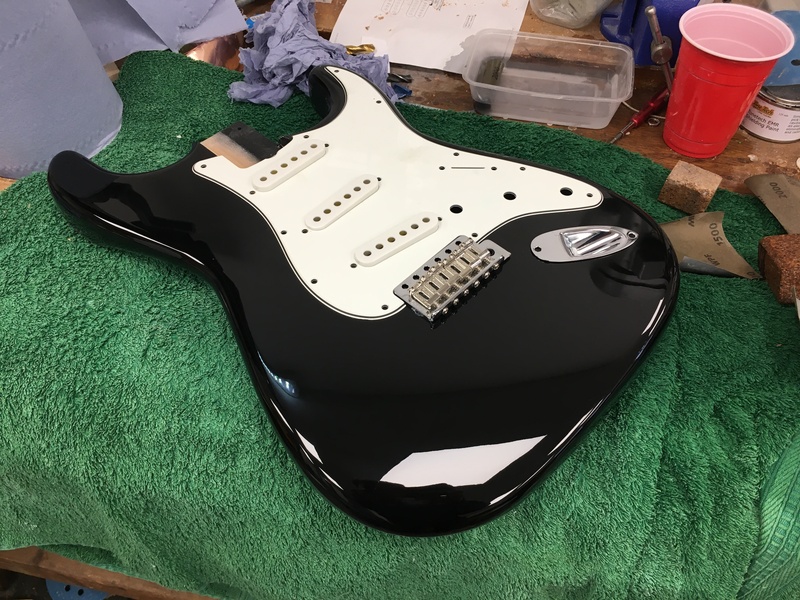 Just did a no clearcoat black one yesterday that went well because I managed to negate the need for sanding and buffing by flatting back the penultimate black coat with 1000 grit and shooting a super level final black coat. Once aged a bit it came out looking great, a vintage kind of sheen while looking a little bit lived in. 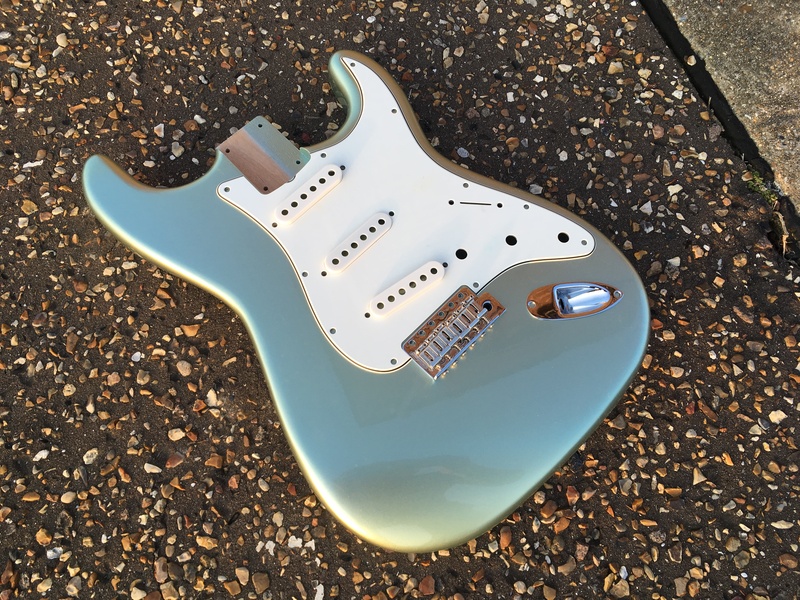 Jon, the single best decision I made years ago was having a separate booth for Flake and Metallics, the risk of contaminants getting into solid finishes and translucent ones was huge as you well know that flake will get everywhere. I don't think everyone appreciates the effort required on a solid gloss black. The finest of scratches will look like the Friggin Mariana Trench....Great work mate. Love the Metallics you're doing to...I'm going to sponge some advice off you very soon via pm of that's okay.